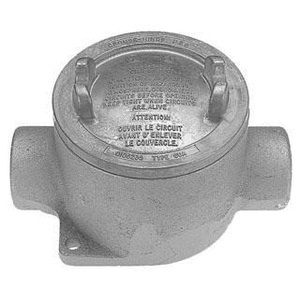 Crouse-Hinds Condulet® Round conduit outlet box of trade size 3/4-Inch, protects and routes the conduit through two threaded hubs located at feed through. This NEMA 3, 4, 7ABCD, 9EFG conduit outlet box in electro-galvanized aluminum acrylic painted finish, features explosion-proof, rain-tight feraloy iron alloy construction. Dust-ignition-proof conduit outlet box with threaded cover opening, has a dimension of 3-3/4-Inch Dia x 2-25/32-Inch. This conduit outlet box comes with cover to safeguard the conduits from physical damages. It protects conductors in threaded rigid conduit. This conduit outlet box provide protection against exterior explosion where acetylene, hydrogen and other hazardous gases are present. Conduit outlet box is UL 886 listed, CSA C22.2 No. 30 certified and meets NEC/CEC Class I, Division 1 & 2, Groups A, B, C, D, Class II, Division 1, Groups E, F, G, Class II, Division 2, Groups F, G, Class II standards.